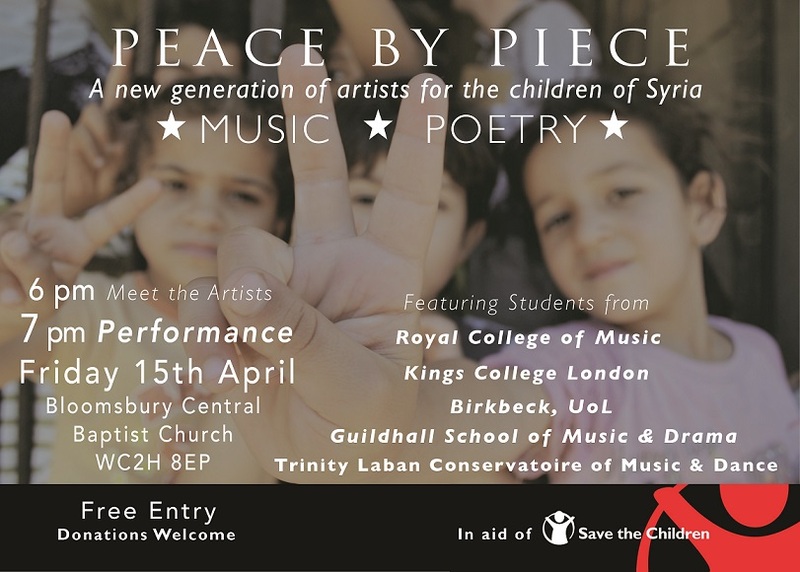 On Friday 15 April at 7 pm, in the Bloomsbury Central Baptist Church in London, a concert will be held in support of the children of Syria. A wealth of great music and poetry will be performed by exceptional young Slovene artists of London and their friends from around the world. You will hear the world premiere of a piece by Jan Gorjanc and another world premiere by British-Australian composer Nicholas Hennell-Foley. Also, two Slovenian cellists from Trinity, Aristel Škrbić playing marimba, Spanish harp player Anna Quiroga, and much more. Before the concert, at 6 pm, you can meet and talk with the artists. Join us in the exciting experience! There is no charge for entry, but please contribute generously to the collection for the children of Syria.